We’ve been flying since before we could walk. 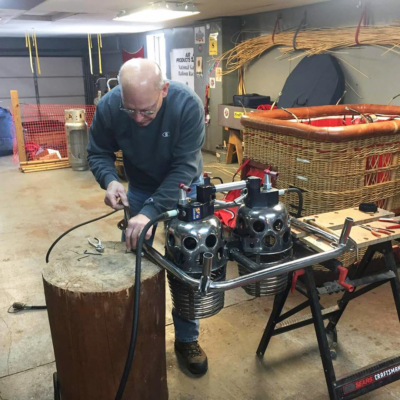 Our roots lie with Liberty Balloon Company of Western New York, owned and operated by Dad (Carroll) and brothers Lance and Lee Teitsworth. 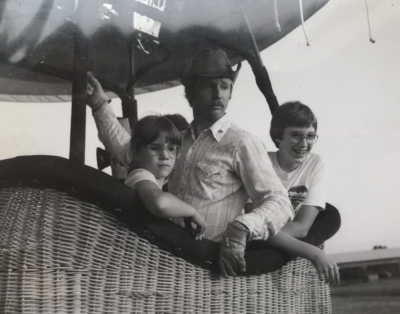 Pictured here with youngest daughter Keira, Liana has been ballooning for as long as she can remember (that’s her in the ancient photo above!! ), earning her pilot’s license in 1995. 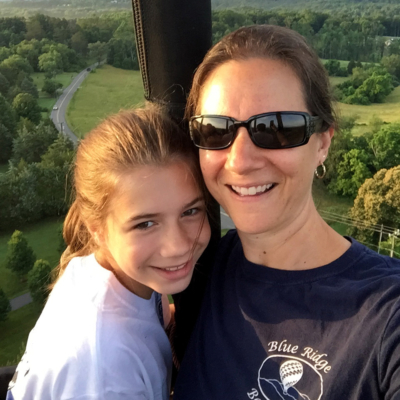 Upon completion of her Biology degree at UVA, she promptly realized a traditional career wasn’t for her… so in ’99, Blue Ridge Ballooning was born. Even after close to 2,000 hours of flight time, you’ll never hear her complain about the view from her “office”! When she’s not flying, she’s probably out training for the next triathlon, roasting nuts at a friend’s bakery, or offering financial coaching in the local community. 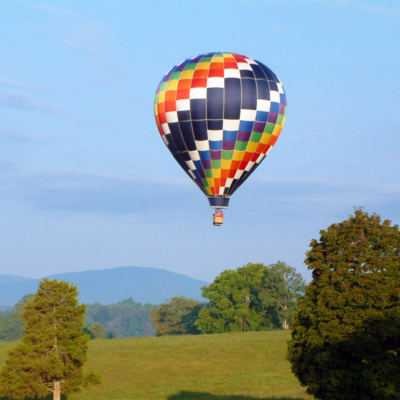 Jim’s role as “anchorman” for Blue Ridge Ballooning is only one of his job titles. He is also a personal trainer, scuba diver, small group leader, and (believe it or not!) aficionado of all things Disney! If he happens to have spare time, Jim is most likely found enjoying the latest upgrade (or plotting the next one!) to his ever-improving home theater system. 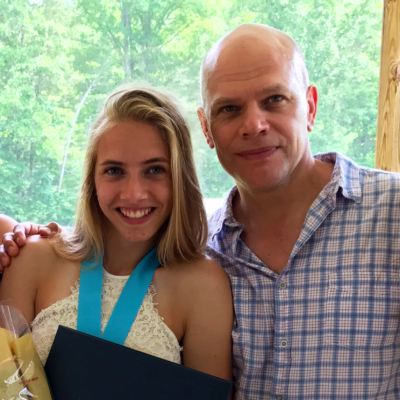 Jim and Liana’s middle daughter Nicole is already an accomplished chase crew member and has her eye on becoming a pilot herself… which will gel nicely with her plans to pursue a career in education. 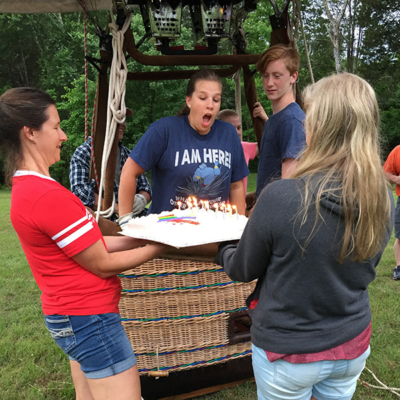 Occasionally, she even likes to celebrate her birthday from the basket! 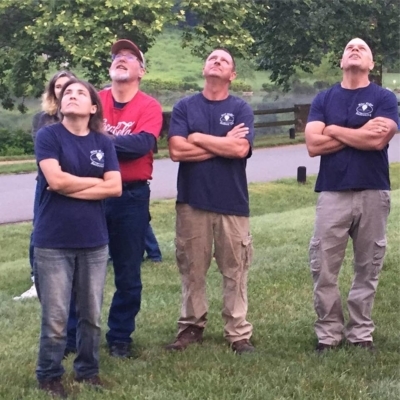 Pictured here with his lovely wife Laura and good friend Marty Miller, Tim is the heart and soul of our ground crew. His strong back, intuitive knowledge of the winds (thanks to his boating experience), and hard working disposition make him an indispensible part of the team. We especially love having him crew on weekends, when Laura is able to join him! If you’re going to fly an aircraft, don’t you want the “Best” in the business taking care of maintenance? 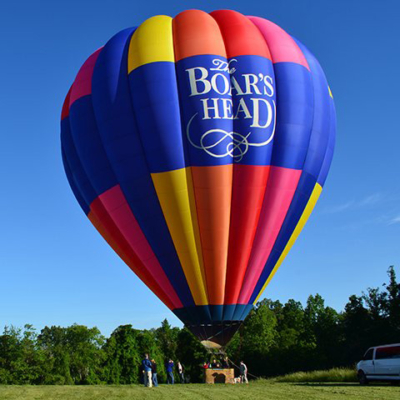 Located outside of Allentown, PA, Bert and Joanie provide all of the required maintenance, annual inspections, and any necessary repairs to all of our balloon equipment. A long time family friend, we were thrilled when Philip relocated to Virginia so we could welcome him to our team. He has a real job during the week but occasionally spends weekends with us to get his ballooning fix, aka “altitude adjustment”! 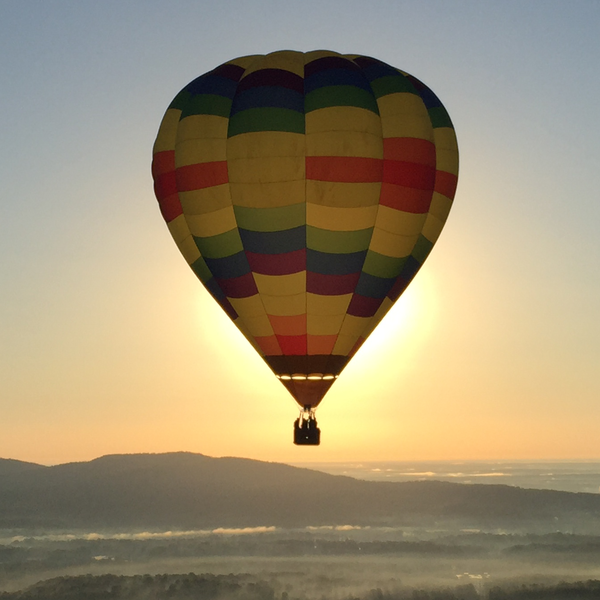 Curious which of the balloons you see flying over Charlottesville are ours? Here’s a guide. 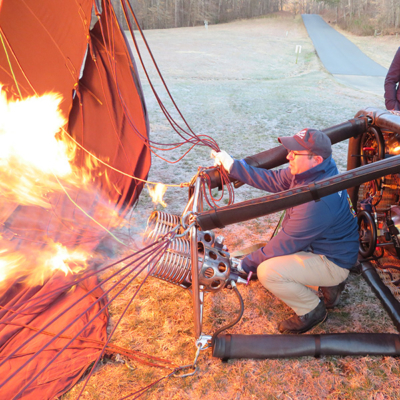 Our first passenger balloon! In service 2000-2009. Her colors were a bit faded by the end of her life, but how many other balloons have seahorses prancing just above the basket? 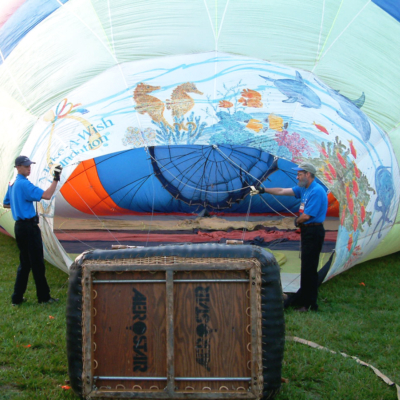 Our first NEW balloon in 2005. Retired from flight in 2017, but still in service for “walkabout”. 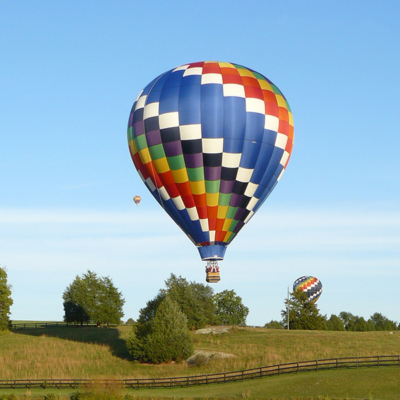 Continuing the tradition of rainbow swirl patterned balloons, Majestic is our newest and most frequently used passenger balloon. 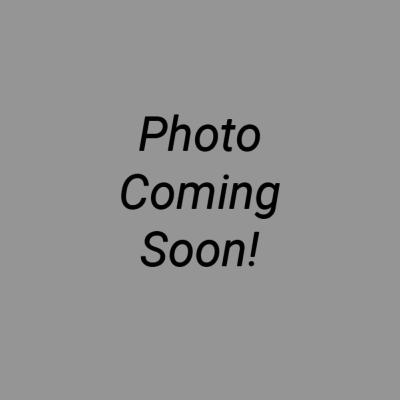 Soon to be added to the fleet in 2019. Liberty will perfect for flying banners! 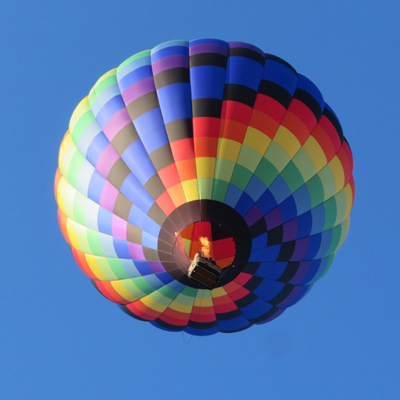 The ballooning community in our area is robust! 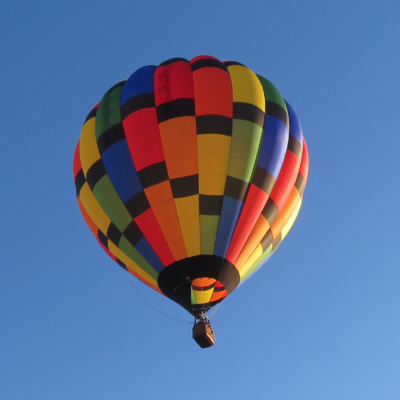 We frequently launch and fly alongside our friends and colleagues flying these colorful balloons.